SAN MARINO, Calif.—The Huntington Library, Art Collections, and Botanical Gardens continues to celebrate the centennial of the U.S. National Park Service in the second of two consecutive exhibitions that focus on the critical role that national parks have played in the history of the United States. “Geographies of Wonder: Evolution of the National Park Idea, 1933-2016” depicts the unceasing public enthusiasm for national park spaces, as well as the steady pace of change in the concept of a “national park” that grew to include national lakeshores and seashores, wild and scenic rivers, battlefields, industrial sites, parkways, and trails. The exhibition—on view in the West Hall of the Library from Oct. 22, 2016, to Feb. 13, 2017—will illuminate the great paradox established by the National Park Service’s founding legislation: how to make the lands under its management available for public enjoyment, while at the same time ensuring the preservation of those lands for the use of future generations. Drawing on nearly 100 items gathered from The Huntington’s library holdings, as well as from various private collections, “Geographies of Wonder: Evolution of the National Park Idea” will include maps, advertisements, illustrated guide books, travel narratives, promotional brochures, scientific surveys, reports, and correspondence that will highlight the experiences of visitors to the parks and the many—sometimes conflicting—visions of national parks that have taken shape over the past 80 years. Among the most indelible images in the exhibition is a view of the Grand Canyon and the Colorado River from its southern rim, as depicted in 1911 by William R. Leigh for the Atchison, Topeka and Santa Fe Railway Co., which promoted tourist travel throughout the Southwest. 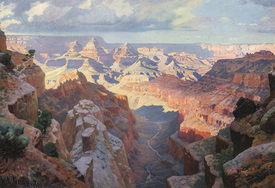 Leigh’s image, used by the Santa Fe Railway for various promotional purposes, aptly captures the canyon’s scenic magnificence, which many Americans equated with a unique national identity. In subsequent decades, however, popular understanding of the park’s significance has shifted as Americans have gained a deeper understanding of the intricate ecologies of the natural world. The presence on the Colorado River of structures such as Glen Canyon Dam have changed the river by altering the temperature of the water, its peak flows, and the flora and fauna that can survive along its banks. The attraction of the Grand Canyon, which combined scenic wonder with the allure of the indigenous peoples of the region, has continued unabated for more than a century, drawing travelers from all over the country and around the globe, said Blodgett. Among the exhibition items are early examples of publicity efforts by the Park Service, railroads, and concessionaires to capitalize on this interest. In a 1931 brochure titled “Trails and Automobile Drives,” a contrast is drawn between the traditional mule-back tours of the canyon’s Bright Angel Trail and a sleek automobile visiting pueblos of people living near the park. The juxtaposition of new and old technologies, as well as of modern and ancient cultures, is a common theme throughout materials promoting travel to the national parks. Examples include a 1938 brochure for the Burlington Route, depicting ultramodern, streamlined railroad trains under the rubric of “the National Park Line,” and a 1947 Union Pacific Railroad advertisement boosting the parks in southern Utah, such as Bryce and Zion, as well as the northern rim of the Grand Canyon. And there is a 1947 advertisement for Western Air Lines that encourages vacationers to fly to national park destinations in the American West, maximizing their time at sites of natural wonder through the speed and convenience of air travel. Even as such promotional campaigns for existing parks moved into high gear, the national park system itself continued to expand. California’s Death Valley, once seen by many Euro-Americans as a horrifying and desolate location, entered the system in 1933 as a National Monument, and Joshua Tree was likewise designated in 1936. In hopes of preserving substantial portions of “primeval America,” groups such as the Sierra Club advocated for the creation of parks in settings such as King’s River Canyon in California, as depicted by a 1939 brochure that emphasizes the grandeur of the Sierra Nevada as scenic wilderness. With the success of such campaigns, more wilderness areas were added to the system in the decades that followed, reflecting the growing enthusiasm for unspoiled landscapes that culminated with the passage of the Wilderness Act in 1964. Other changes followed quickly in the 1960s as the Park Service extended protection to seashores, lakeshores, wild and scenic rivers, and historic trails to serve the needs and interests of an ever-more urbanized population. By the late 1970s and 1980s, “national recreation” areas were designated adjacent to major cities, such as Gateway in New York City and Golden Gate in San Francisco. This impulse extends to the Santa Monica Mountains in the Los Angeles area, designated a National Recreation Area in 1978, and the current proposal for the adjacent “Rim of the Valley,” which would significantly expand its boundaries. Throughout this period, however, the Park Service’s other mandate, as established in its founding legislation of 1916, was to ensure conservation of the parks unimpaired for future generations. Harried Park Service professionals and alarmed conservationists struggled to strike a balance between these two imperatives as the annual number of visitors spiraled ever upward, from 21 million in 1941 to 100 million in 1964, 200 million in 1976, and 292 million in 2014. Such staggering growth put ever greater pressure on natural habitats, as well as Park Service and concessioner facilities, at many of the nation’s best-loved parks. Moreover, as scientific knowledge grew more sophisticated during the 20th century, with a greater emphasis on ecology, it became clear that many parks faced significant environmental problems from economic developments outside of their borders, such as increasing air pollution at the Grand Canyon and elsewhere, generated by power plants in the Southwest. With such challenging issues connected to the parks, one of the key goals of the exhibition, according to Blodgett, is to provide viewers with a deeper understanding of the innate complexity of the national park idea as it has developed over time. “I hope visitors will be inspired to consider how national parks should evolve through the 21st century and beyond,” he said. Image: William R. Leigh, Grand Canyon (1911), as adapted for Fred Harvey Service dining car menu, 1950. The Huntington Library, Art Collections, and Botanical Gardens. Reprinted with permission of the BNSF Railway Company.